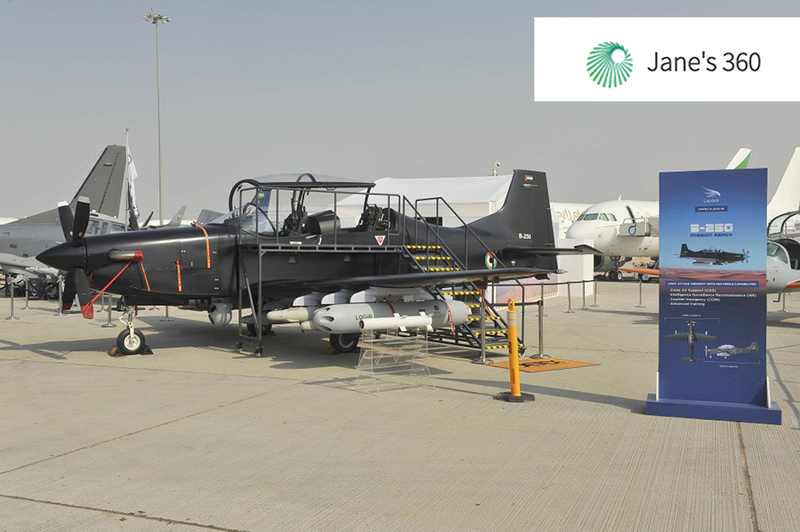 United Arab Emirates (UAE)-based Calidus has revealed a new turboprop aircraft designed for light attack counterinsurgency (COIN). The single-engined B-250, which was unveiled at the Dubai Airshow running from 12 to 16 November, is a tandem twin-seat aircraft that is built around the Rockwell Collins Pro Line Fusion avionics suite. Calidus had not responded to a request for further information at the time of writing, but according to media reports the aircraft was designed in conjunction with Brazilian company Novaer. Images of the aircraft on static display at Dubai show it to be fitted with a retractable electro-optical/infrared sensor turret, and provisioned with six underwing and one underfuselage hardpoints. Besides the COIN role, the aircraft is billed as being suitable for intelligence, surveillance, and reconnaissance (ISR); close air support (CAS); and advanced pilot training.